NOTICE: Activation key must be used on a valid Steam account, requires internet connection. ABOUT THE GAME	Embark on a quest from the gods of rock with heavy metal heroes Axl, Lars, Freddie and Ozzie in Super Dungeon Bros, a fast paced, action focused, rock themed dungeon brawler! Play on your own or with up to 4 friends in couch or online co-op as you raid the deepest dungeons of Rökheim … in search of epic loot, hordes of evil undead and the legends of long lost fabled rock stars! Wield wicked weapons with devastating destruction or exploit the punishing puzzles and terrifying traps that will slice and dice foes and bros alike. Fling your friends onto far off ledges and distant trap triggers, hurl your bros at advancing attackers or unleash your tag team tactics with the ultimate bro-op offensive! If really you’re up for the challenge, test your heavy metal in the deadly daily dungeon or master the way of the wicked weekly dungeon and climb to the peak of the global leaderboards. Just remember, always put your BrosB4Foes! KEY FEATURESMultiple Worlds Explore the rock themed realm of Rökheim and dive deep into the worlds of Cryptheim (an underground dungeon complex), Chillheim (a brewery built upon a natural brew geyser) and Bogheim (a sprawling jungle filled with poisonous plants and animals). Better with Bros! Play with up to 4 friends or venture into the deepest depths of Rökheim alone in scary single player. Online & Couch Co-Op	Raid the dungeons of Rökheim in on or offline co-op multiplayer with cross platform play between Xbox One & Windows 10 or PS4 and PC/Mac. Endless Dungeon Combinations	Never rock the same dungeon twice thanks to the random room generation AI, with unlimited dungeon designs. Roguelike Platforming	Exploit the punishing puzzles with deadly effect or harness the terrifying traps that will slice and dice foes and bros alike! Wicked Weapons	Choose from a range of wicked weapons over 4 weapon classes including swords, crossbows, hammers and wands as you plunder the darkest depths of Rökheim in search of epic loot! Mini Missions	Maintain your game with regular mini missions to increase your wealth and in game arsenal! Daily & Weekly Dungeons Compete with friends from around the world in the deadly daily dungeon or master the way of the wicked weekly dungeon to climb to the peak of the global leaderboards. Rock the Night Away Epic boss battles and a cast of fiendish foes compliment a totally rocking soundtrack! SYSTEM REQUIREMENTS WINDOWS	Minimum: OS: Windows 7 Processor: Dual Core 2.0GHz Memory: 2 GB RAM Graphics: Nvidia GeForce Gt 740 DirectX: Version 10 Network: Broadband Internet connection Storage: 2500 MB available space Recommended: OS: Windows 10 Processor: Dual Core / 3.0 GHz Memory: 4 GB RAM Graphics: Nvidia GTX 750ti DirectX: Version 11 Network: Broadband Internet connection Storage: 2500 MB available space ©2016 React Games. Developed by React Games. 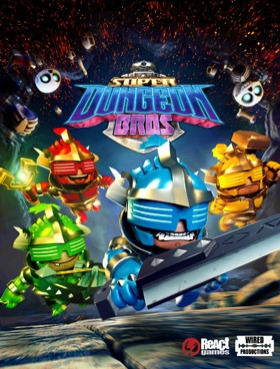 Licensed to and published by Wired Productions Ltd. React Games, Super Dungeon Bros and the Super Dungeon Bros logo are trademarks of React Games. All rights reserved.